The Houston Texans continue to be linked to a possible trade for Jimmy Garoppolo. 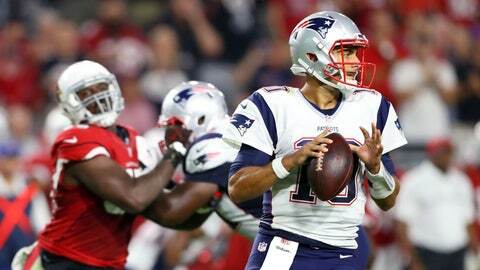 John McClain of the Houston Chronicle believes the New England Patriots could end up calling the Texans in an attempt to send Garoppolo to Houston. If New England tries to trade Jimmy Garoppolo, who is entering the last year of his contract, calling the Texans would be an obvious move for coach Bill Belichick. McClain makes a good point. Belichick knows his former offensive coordinator and current Texans head coach Bill O’Brien needs a quarterback. I just wonder if Belichick is willing to give up less than a first round pick for Garoppolo. Because I don’t see the Texans giving up the 25th overall pick. On the other hand, Peter King of TheMMQB.com doesn’t believe the Patriots will trade Garoppolo. Tom Brady just finished a season with 35 touchdowns and five interceptions. He’ll next take a snap when he’s 40, but when he looks this good at 39, no one expects him to fall off a cliff. Got it. So go get a first-round pick for Garoppolo and develop Jacoby Brissett. But there are two problems with this logic, as I see it. And understand, I have not spoken with Belichick about this; it is a simple reading of the tea leaves knowing the way Belichick could be looking at it. One: In the 17 seasons since the Patriots drafted Brady, Garoppolo has to be the first man Belichick looks at and thinks can be the Patriots’ quarterback for the next decade. He’s smart, makes good decisions, has shown (admittedly in a very brief window last September) that he can beat quality opponents. Two: The Patriots do the most with lesser prospects of any team in recent league history. If you’ve got a starting quarterback about to turn 40, regardless of his incredible good health and fitness, whatever Brady gives the Patriots now is a bonus. If I’m Belichick, I’m thinking: I’d rather have a quarterback on my roster who I know can win January games in 2017 than go without him and have a first-round pick instead. I can’t tell you how he’s thinking; I can only tell you that based on Belichickian logic, I think that’s most likely how he is thinking heading into the off-season. I think King also makes a valid point. If I was Belichick and the Patriots I wouldn’t trade Garoppolo and I also wouldn’t let him walkt a free agent next year. I would figure a way out to keep both Garoppolo and Tom Brady.